In May of 2014 Dave and Steve attended one of the greatest beer events in the world: the Firestone Walker Invitational in Paso Robles California. Here are some thoughts and images. WHY GO TO MICHIGAN AT 4:00 AM? With scores of diverse and bold beers on tap, a battle of the bands, and an eclectic mix of offerings such as elk ribs, muscat brains, and Rocky Mountain oysters, the party to celebrate the first tapping of a Marshall Michigan brewer’s limited release holiday beer, may e reason enough for a beer lover to take a trip to Dark Horse Brewing. On top of all that, DH offered a battle of the bands and the sale of bottles, such as Bourbon Barrel Aged Plead the Fifth and Barrel Aged Monster 29, an imperial barley wine. These beers in particular sell out quickly, meaning you get in line early or get left in the cold. And cold it was. Arriving around 7:30 AM, we approached an already winding line in a cold rain. Despite having left at 4:00 AM, our place was over 50 deep in the queue, and the temperature dropped every hour. We had some time to wait until 11:00 when tickets were handed out, assigning your spot in line for the beer buying at 3:00. Thankfully, the line was packed full of friendly beer geeks, ready to share a bottle or two of some rare tipple they had acquired along the way. 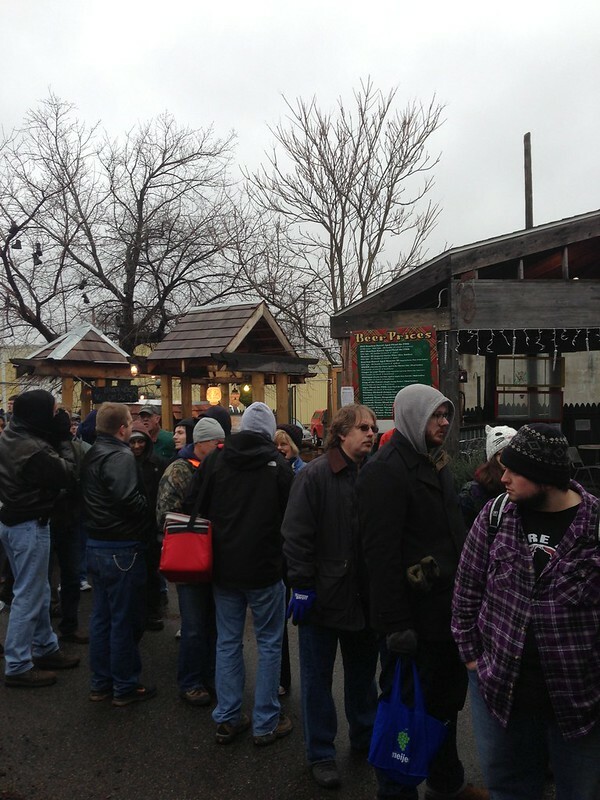 the rain turned into snow, but we all felt warmer with the convivial atmosphere and delicious samples warming our souls. Following the passing out of numbered tickets for those wanting to buy beer later, there was a three hour lull. This might of been a good time for a nap, or in our case, some well needed lunch. Food at the cozy Dark Horse bar was a tasty mix of pizza and garlic bread. While none of the special party beers were on tap at this time, I got to sample the delicious Thirsty Trout Porter, a Baltic Porter. Don’t recall seeing this one at my local shops, but try it if you can find it! Of the draft beers I tried, Dark Star Lover, a raspberry chocolate stout aged in oak barrels was an amazing mix of flavors, possibly the best beer Dark Horse brews. Other stand outs were the odd but fun Ginger in your Pants, hop variants on their Crooked Tree IPA (named backwards as in ‘Ollirama Dekoorc Eert’), and the tasty chocolate based MMMM. 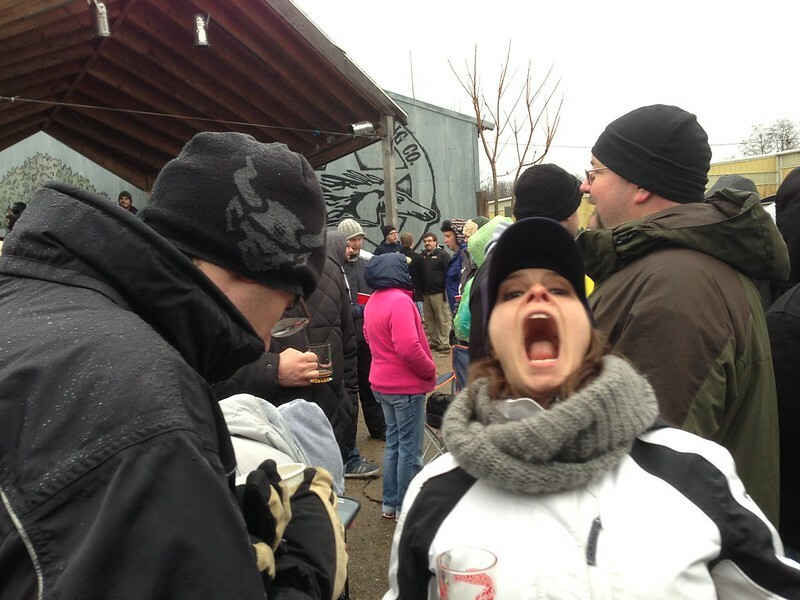 The lambics were not to my liking, unfortunately. Best part of the sampling was that we were able to do it while waiting in the very slow line. But we didn’t rise at 3:00 AM for just a party, no matter how fun the tap list. Bourbon Barrel Aged Plead the Fifth is the prize I was after, and at our spot in line, I had no problem getting some, along with some Monster 29, BA Monster 29, Ginger in Your Pants, and MMMM… Mission accomplished. But was it worth the cold temps, early rising, and long day? If your only enjoyment will come from scoring bottles, the costs may out weigh the benefits. There were a number of people that were shutout from some or even all of the beers they were hoping to buy. 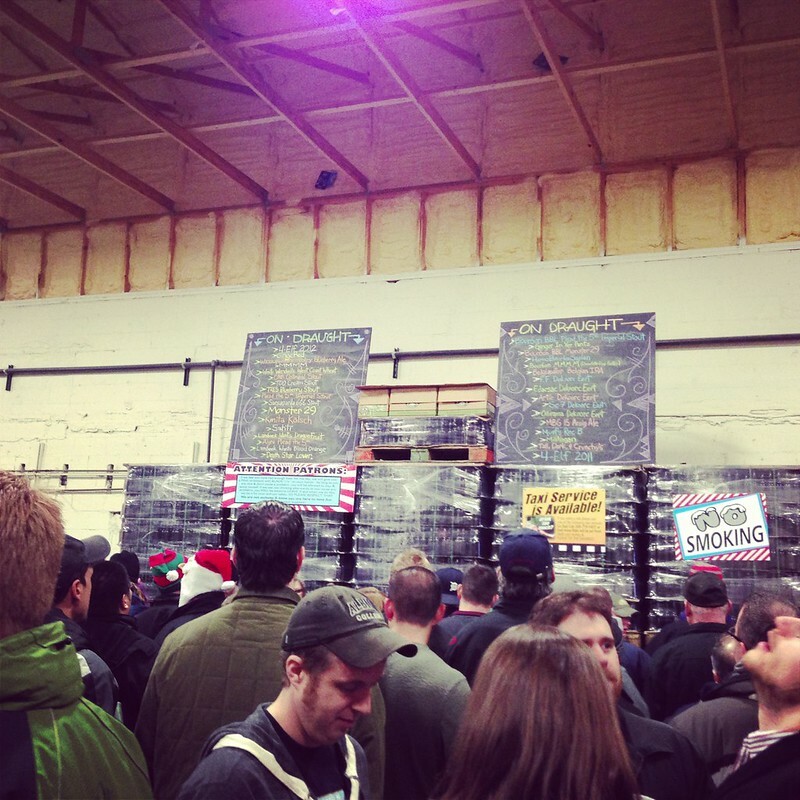 But if you are there to take in the massive selection of delicious drafts, try some succulent, obscure creatures, and hang with pleasant locals and generous beer geeks, the Dark Horse 4 Elf Party is a great event. One I will hopefully be returning to next year. Cinco de Mayo has become, for some Americans, an excuse to show off their multicultural sensitivity while putting away gallons of yellow, fizzy beer. The history of this popular holiday however, is often clouded in misconceptions. 1. Cinco de Mayo is not widely celebrated in Mexico. The day is celebrated in certain communities, mostly in the the town of Puebla, and is not a national bank holiday. 2. Cinco de Mayo is not Mexican Independence Day. Not even close. It’s September 16th. May 5th is the anniversary of the Mexican victory over the French in the first Battle of Puebla. 3. The Most Interesting Man in the World is not an actor living in Vermont. Don’t get me wrong, Jonathan Goldsmith is an interesting guy, but he’s no Richard Branson class polymath. 4. Beating the French in battle is hardly a cause for celebration. While it was a surprising victory, Mexico being vastly outnumbered, the French ultimately won the war. And it was the French. 5. Cinco de Mayo was first celebrated in the U.S. following a Corona marketing campaign. During the foreign beer craze on the 1980’s Grupo Modelo (makers of Corona Extra) heavily invested in manufacturing Cinco de Mayo as a Mexican St. Patrick’s Day. They were in large part successful. The holiday was however first celebrated by Mexican immigrants in Texas and California decades earlier. If you really need a reason to get your drink on, how about an alternative May 5th event? Raise a glass to Cy Young on the anniversary of his throwing the first perfect game May 5th, 1905 with a Pennant Ale from Brooklyn Brewing. Or take in the sport of kings and try beer aged in bourbon barrels while watching the Kentucky Derby. If your friends insist on a beverage reminiscent of Mexico, why not try something like Westbrook’s Mexican Cake, a beer made with chocolate, cinnamon, vanilla, and hot peppers? Now that is something to celebrate!